Burley junior Makayla Tolman spikes the ball against Minico on Thursday, Sept. 20, 2018, at Burley High School in Burley. Burley junior Makayla Tolman walks to the bench after scoring the winning point of the first set against Minico on Thursday, Sept. 20, 2018, at Burley High School in Burley. Burley junior Makayla Tolman sets the ball during the game against Minico on Thursday, Sept. 20, 2018, at Burley High School in Burley. 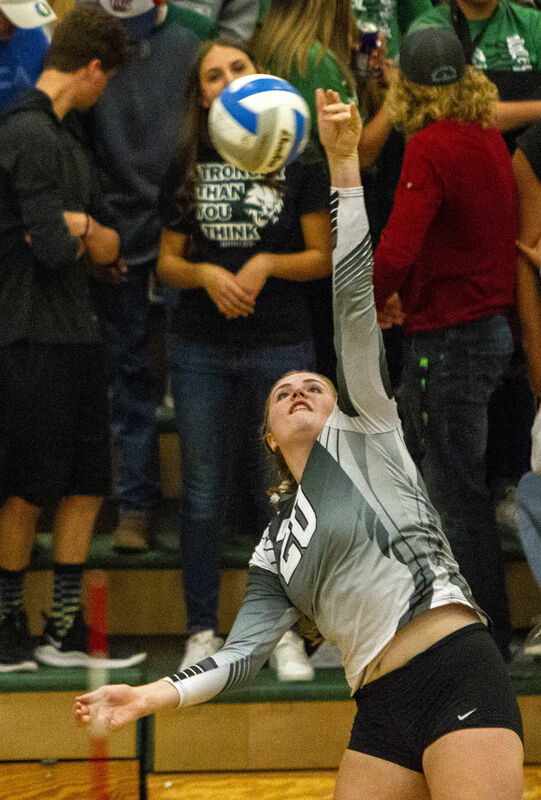 In her first two years as a Burley High School volleyball player, Makayla Tolman was a part of teams that only came up short against Twin Falls. It appeared that, in her junior season, it would only be much of the same. Two losses to the Bruins during the season made it seem as if Tolman and the Bobcats would have to wait another year, but they got one more shot. They took it, and Tolman was at the heart of it — a 3-1 victory in the 4A state tournament. Tolman said it was a goal for the team to finally beat the Bruins this past season, and she was a big reason as to why it happened. That victory was among Tolman’s favorite this year. There were plenty to choose from, as she led the Bobcats to a 27-13 record and that state tournament appearance. She was key in just about everything Burley did, and stood out as one of the best volleyball players in the area, earning the nod as Times-News volleyball player of the year. Perhaps one of the biggest contributors to Tolman’s outstanding season was her commitment to BYU for volleyball, made back on April 8. Once she officially knew what her future holds, Tolman, who had already been a part of Burley’s third-place team at state last season, was ready to take it up a notch. She led the Bobcats in kills and blocks per match, while assuming some new duties, leaving the front row to do some work from the back. Shirley said Tolman posted a .398 hitting percentage and 50 percent kill rate in district play. Tolman enjoyed undertaking new roles, and discovered an affinity for playing defense in the back row, although she said her preference will always be with hitting and blocking up front. While she hit her stride in all these roles on the court, there was another aspect of her game that improved, and it had little to do with hitting a volleyball. “She has become resilient on and off the court in adverse conditions, which has been a huge benefit to our team,” Shirley said. “Other team members can look up to her, in more ways than one, and see her play with passion. Tolman is ready to take on the responsibility Shirley is prepared to hand her, too. The Bobcats will lose some key figures from this season’s team, but, with a squad built around Tolman, they’ll figure to continue competing, both because of her qualities as a player and a person. Her commitment to BYU has already shown its benefits in relieving her of some unwanted stress, and Shirley noted that, despite her status as a Division I recruit, Tolman remains unchanged. Everything she brought to the court this season, she’ll be expected to bring it and more next year.